OK, we talked about cellos on the Red Rose side of things. You can catch up on them by clicking this link. Red Rose cellos are just like any other. They didn't want coffee or baking powder or the like to mess up the cards so they protected them in cellophane. What kinds of cellos are there to collect from Brooke Bond? Dave Curtis, from England, decided that I can't always talk about Red Rose. There are other things in life to collect. Even other tea cards... who knew? Anyway, Dave sent me a really nice cello from across the pond. Thanks Dave! It's my first. 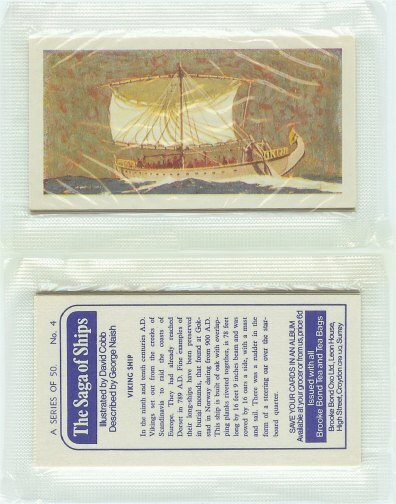 Its a group of 4 (or more) cards from the Saga of Ships series (the 22nd from Brooke Bond). Most of the cellos I have seen for Red Rose have only 2 cards in them. I have seen a few with 4 and at the end of a run they have 2 with a completion card and/or a free album coupon. I don't know if the same is true with Brooke Bond of England. How about it collectors? What's the scoop? Does the British version ever come with completion cards or a free album coupon?